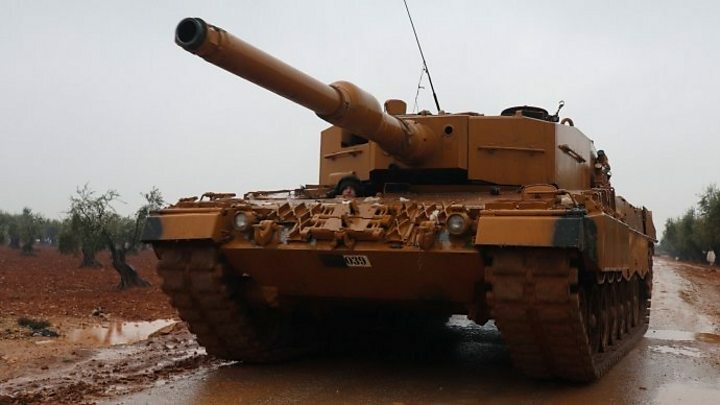 Turkish forces have captured a number of villages in north-western Syria, on the third day of an offensive to oust Kurdish fighters, Turkish media report. Troops, accompanied by allied Syrian rebels, reportedly seized control of several areas in Afrin on Monday. Turkish President Recep Tayyip Erdogan said he would not "step back" in the assault following talks with Russia. Turkey considers the Kurdish YPG militia it is targeting in the region to be a terrorist group. "We are determined, Afrin will be sorted out," Mr Erdogan said in a live television broadcast in Ankara on Monday. "We will take no step back," he said, adding: "We spoke about this with our Russian friends; we have an agreement." The YPG, which controls much of north-eastern Syria, is believed by Turkey to be an extension of the Kurdistan Workers Party (PKK), which has fought for Kurdish autonomy in Turkey for three decades. The YPG denies any direct links and is a crucial part of a US-backed alliance battling Islamic State (IS) jihadists in Syria. Ankara has condemned the US for supporting the YPG and this latest development in the Syrian civil war puts Turkey on a collision course with its Nato ally. What has happened on the ground? On Monday, the Afrin villages of Shankal, Qorne, Bali and Adah Manli were reportedly captured, along with rural areas including Kita, Kordo and Bibno, according to Turkey's state-run Anadolu news agency. But the Syrian Observatory for Human Rights (SOHR), a UK-based monitoring group, said the YPG had repelled Turkish troops from two villages that had been briefly captured in heavy fighting. The YPG also said that it had retaliated to Turkey's ground offensive with rocket fire on Turkish border areas. Two people died and 12 others were wounded when a rocket hit a camp housing Syrian rebel fighters near the border in Turkey's Hatay province, local reports said. The Syrian government, its ally Iran and Egypt have all condemned Turkey's offensive. A UN security council meeting due to take place later on Monday, which was called by France to discuss the humanitarian situation in Syria in general, is expected to discuss the latest developments in Afrin. What's the background to the offensive? Turkish ground troops, assisted by rebels from the Free Syrian Army (FSA), crossed into northern Syria on Sunday as part of its offensive - called "Operation Olive Branch" - to push out the Kurdish People's Protection Units (YPG). Mr Erdogan has vowed to crush the YPG "very quickly", but the US is urging Turkish "restraint" in order to avoid civilian casualties. Plans for the operation were believed to have accelerated when US officials said earlier this month that it would help the Syrian Democratic Forces (SDF) alliance, which is dominated by the YPG, build a new "border security force" to prevent the return of IS. Some 25,000 pro-Turkey fighters have joined the offensive, rebel commander Maj Yasser Abdul Rahim told Reuters. It is not clear how many Turkish soldiers are on the ground. Turkey's military said it had hit 45 targets on Sunday, as part of its campaign. The SOHR said on Monday that 18 civilians had so far been killed in the Afrin region. The group said that most were killed in Turkish air strikes over the weekend. Kurdish rockets also hit the Turkish border towns of Kilis and Reyhanli at the weekend, with casualties reported. There were further casualties in Monday's rocket attack on an FSA camp in Hatay province. Turkey's military has been shelling the Afrin region since Thursday. How have the key players reacted? Western powers, including the US and France, are urging restraint.